Veteran pilot Jim Henry and Udvar-Hazy Center docent Bruce Cranford, one of the docents who met with Henry in May of 2009, standing in front of the Vought F4U-1D Corsair that Henry flew. Panoramic view inside the Vought F4U-1D Corsair. By V-J Day, September 2, 1945, Corsair pilots had amassed an 11:1 kill ratio against enemy aircraft. The aircraft's distinctive inverted gull-wing design allowed ground clearance for the huge, three-bladed Hamilton Standard Hydromatic propeller, which spanned more than 4 meters (13 feet). The Pratt and Whitney R-2800 radial engine and Hydromatic propeller was the largest and one of the most powerful engine-propeller combinations ever flown on a fighter aircraft. Charles Lindbergh flew bombing missions in a Corsair with Marine Air Group 31 against Japanese strongholds in the Pacific in 1944. This airplane is painted in the colors and markings of the Corsair "Sun Setter," a Marine close-support fighter assigned to Marine Fighter Squadron VMF-113 in July 1944. On February 1, 1938, the United States Navy Bureau of Aeronautics requested proposals from American aircraft manufacturers for a new carrier-based fighter airplane. During April, the Vought Aircraft Corporation responded with two designs and one of them, powered by a Pratt & Whitney R-2800 engine, won the competition in June. Less than a year later, Vought test pilot Lyman A. Bullard, Jr., first flew the Vought XF4U-1 prototype on May 29, 1940. At that time, the largest engine driving the biggest propeller ever flown on a fighter aircraft propelled Bullard on this test flight. The R-2800 radial air-cooled engine developed 1,850 horsepower and it turned a three-blade Hamilton Standard Hydromatic propeller with solid aluminum blades spanning 13 feet 1 inch. The airplane Bullard flew also had another striking feature, a wing bent gull-shaped on both sides of the fuselage. This arrangement gave additional ground clearance for the propeller and reduced drag at the wing-to-fuselage joint. Ironically for a 644-kph (400 mph) airplane, Vought covered the wing with fabric behind the main spar, a practice the company also followed on the OS2U Kingfisher (see NASM collection). When naval air strategists had crafted the requirements for the new fighter, the need for speed had overridden all other performance goals. With this in mind, the Bureau of Aeronautics selected the most powerful air-cooled engine available, the R-2800. Vought assembled a team, lead by chief designer Rex Beisel, to design the best airframe around this powerful engine. The group included project engineer Frank Albright, aerodynamics engineer Paul Baker, and propulsion engineer James Shoemaker. Beisel and his team succeeded in building a very fast fighter but when they redesigned the prototype for production, they were forced to make an unfortunate compromise. The Navy requested heavier armament for production Corsairs and Beisel redesigned each outboard folding wing panel to carry three .50 caliber machine guns. These guns displaced fuel tanks installed in each wing leading edge. To replace this lost capacity, an 897-liter (237 gal) fuselage tank was installed between the cockpit and the engine. To maintain the speedy and narrow fuselage profile, Beisel could not stack the cockpit on top of the tank, so he moved it nearly three feet aft. Now the wing completely blocked the pilot's line of sight during the most critical stages of landing. The early Corsair also had a vicious stall, powerful torque and propeller effects at slow speed, a short tail wheel strut, main gear struts that often bounced the airplane at touchdown, and cowl flap actuators that leaked oil onto the windshield. These difficulties, combined with the lack of cockpit visibility, made the airplane nearly impossible to land on the tiny deck of an aircraft carrier. Navy pilots soon nicknamed the F4U the 'ensign eliminator' for its tendency to kill these inexperienced aviators. The Navy refused to clear the F4U for carrier operations until late in 1944, more than seven years after the project started. 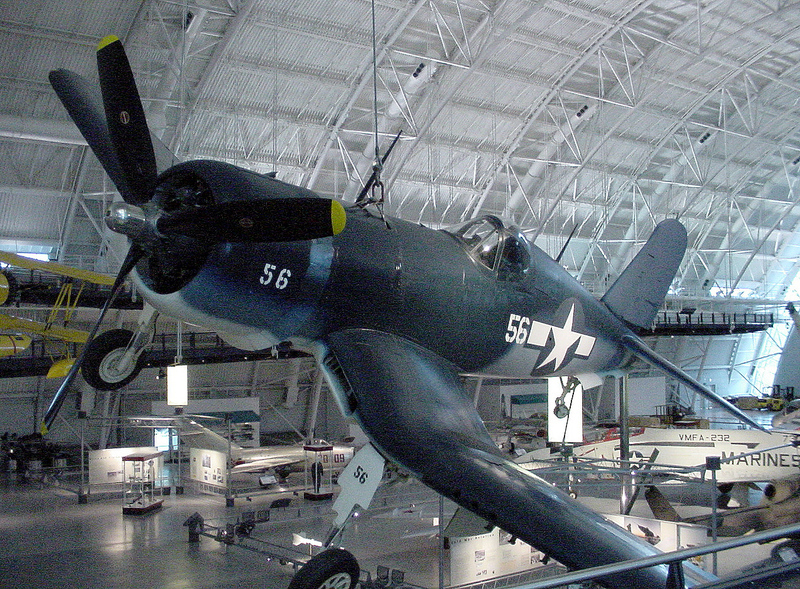 This flaw did not deter the Navy from accepting Corsairs because Navy and Marine pilots sorely needed an improved fighter to replace the Grumman F4F Wildcat (see NASM collection). By New Year's Eve, 1942, the service owned 178 F4U-1 airplanes. Early in 1943, the Navy decided to divert all Corsairs to land-based United States Marine Corps squadrons and fill Navy carrier-based units with the Grumman F6F Hellcat (see NASM collection). At its best speed of 612 kph (380 mph) at 6,992 m (23,000 ft), the Hellcat was about 24 kph (15 mph) slower than the Corsair but it was a joy to fly aboard the carrier. The F6F filled in splendidly until improvements to the F4U qualified it for carrier operations. Meanwhile, the Marines on Guadalcanal took their Corsairs into combat and engaged the enemy for the first time on February 14, 1943, six months before Hellcat pilots on that battle-scared island first encountered enemy aircraft. The F4U had an immediate impact on the Pacific air war. Pilots could use the Corsair's speed and firepower to engage the more maneuverable Japanese airplanes only when the advantage favored the Americans. Unprotected by armor or self-sealing fuel tanks, no Japanese fighter or bomber could withstand for more than a few seconds the concentrated volley from the six .50 caliber machine guns carried by a Corsair. Major Gregory "Pappy" Boyington assumed command of Marine Corsair squadron VMF-214, nicknamed the 'Black Sheep' squadron, on September 7, 1943. During less than 5 months of action, Boyington received credit for downing 28 enemy aircraft. Enemy aircraft shot him down on January 3, 1944, but he survived the war in a Japanese prison camp. In May and June 1944, Charles A. Lindbergh flew Corsair missions with Marine pilots at Green Island and Emirau. On September 3, 1944, Lindbergh demonstrated the F4U's bomb hauling capacity by flying a Corsair from Marine Air Group 31 carrying three bombs each weighing 450 kg (1,000 lb). He dropped this load on enemy positions at Wotje Atoll. On the September 8, Lindbergh dropped the first 900-kg (2,000 lb) bomb during an attack on the atoll. For the finale five days later, the Atlantic flyer delivered a 900-kg (2,000 lb) bomb and two 450-kg (1,000 lb) bombs. Lindbergh went ahead and flew these missions after the commander of MAG-31 informed him that if he was forced down and captured, the Japanese would almost certainly execute him. As of V-J Day, September 2, 1945, the Navy credited Corsair pilots with destroying 2,140 enemy aircraft in aerial combat. The Navy and Marines lost 189 F4Us in combat and 1,435 Corsairs in non-combat accidents. Beginning on February 13, 1942, Marine and Navy pilots flew 64,051 operational sorties, 54,470 from runways and 9,581 from carrier decks. During the war, the British Royal Navy accepted 2,012 Corsairs and the Royal New Zealand Air Force accepted 364. The demand was so great that the Goodyear Aircraft Corporation and the Brewster Aeronautical Corporation also produced the F4U. Corsairs returned to Navy carrier decks and Marine airfields during the Korean War. On September 10, 1952, Captain Jesse Folmar of Marine Fighter Squadron VMF-312 destroyed a MiG-15 in aerial combat over the west coast of Korea. However, F4U pilots did not have many air-to-air encounters over Korea. Their primary mission was to support Allied ground units along the battlefront. After the World War II, civilian pilots adapted the speedy bent-wing bird from Vought to fly in competitive air races. They preferred modified versions of the F2G-1 and -2 originally built by Goodyear. Corsairs won the prestigious Thompson Trophy twice. In 1952, Vought manufactured 94 F4U-7s for the French Navy, and these aircraft saw action over Indochina but this order marked the end of Corsair production. In production longer than any other U.S. fighter to see service in World War II, Vought, Goodyear, and Brewster built a total of 12,582 F4Us. The United States Navy donated an F4U-1D to the National Air and Space Museum in September 1960. Vought delivered this Corsair, Bureau of Aeronautics serial number 50375, to the Navy on April 26, 1944. By October, pilots of VF-10 were flying it but in November, the airplane was transferred to VF-89 at Naval Air Station Atlantic City. It remained there as the squadron moved to NAS Oceana and NAS Norfolk. During February 1945, the Navy withdrew the airplane from active service and transferred it to a pool of surplus aircraft stored at Quantico, Virginia. In 1980, NASM craftsmen restored the F4U-1D in the colors and markings of a Corsair named "Sun Setter," a fighter assigned to Marine Fighter Squadron VMF-113 in July 1944, when that squadrion was operating from a field on Engebi in the Marshall Islands. All metal with fabric-covered wings behind the main spar. R-2800 radial air-cooled engine with 1,850 horsepower, turned a three-blade Hamilton Standard Hydromatic propeller with solid aluminum blades spanning 13 feet 1 inch; wing bent gull-shaped on both sides of the fuselage.